Liar Pelosi made a surprise visit to Baghdad today. Thanks to George W. Bush and Republicans the vicious Speaker of the House who once said the Iraq War could not be won was able to fly into Baghdad today. Speaker Pelosi made a surprise visit to Iraq today. House Speaker Nancy Pelosi (D-Calif.) made a surprise visit to Iraq Sunday, focusing on economic issues in a meeting with Prime Minister Nouri al-Maliki. 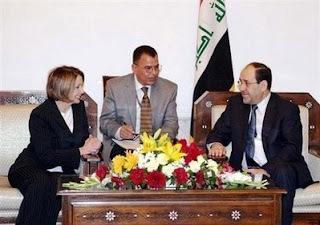 Al-Maliki asked Pelosi to help his war-torn country beat back demands for reparations from neighboring countries for actions taken by Saddam Hussein’s regime, according to an Associated Press report. If ever there was an appropriate time for Iraqis to chuck shoes during a press conference it was today. If Pelosi and Obama had their way, Iraq would be a bloody violent failed state today.